Game 1: In a heated battle between the latest in 3D Mario platforming and a classic 16 bit RPG, Chrono Trigger edged out Super Mario 3D World by two votes and ensured that third parties will get some representation in the Elite Eight. Game 2: Banjo Kazooie's valiant run as a seven seed came to an end with a large defeat at the hands of The Legend of Zelda, the first entry in Nintendo's iconic action adventure series. Sane minds prevail and no rage quit is necessary. Next round will be interesting. I think if Super Mario 3D World had won, then LoZ would have pretty easily made it to the Final Four, but now I'm not as confident. Oh yes, next week will be a barnburner. My top two choices for this bracket both got taken out at once. That's kind of funny, seeing as I've agreed with every other result in this bracket with one exception. 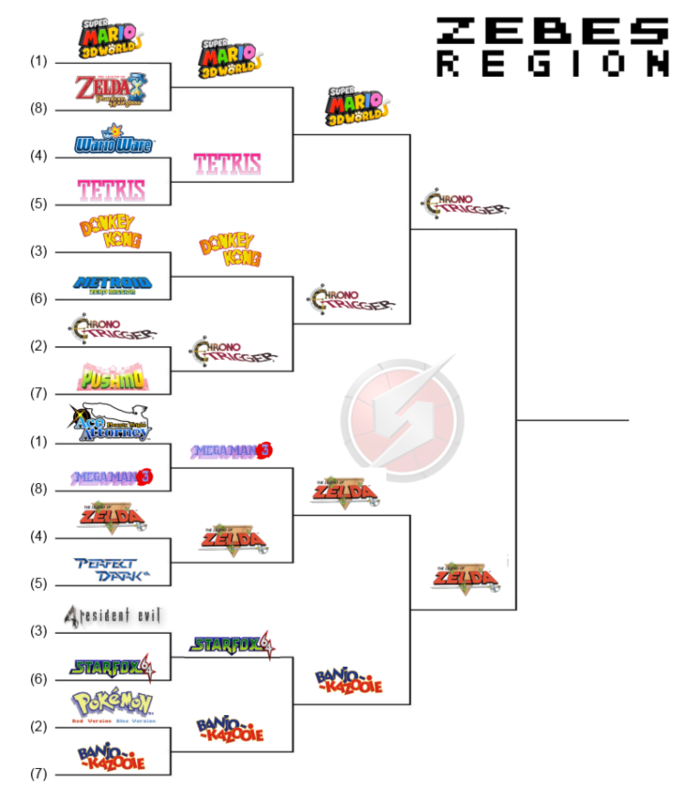 I like Chrono Trigger and Zelda, but I wouldn't have chosen them for the final eight. Zelda would not have been my pick either, but hey, opinions! Banjo had a great run. Came out ahead of Pokemon, RE4 and StarFox 64? Nothing to be ashamed of. @Stephen Negative World, on the other hand, should be ashamed. Resident Evil freaking 4! Star Fox freaking 64!